Welcome to Maine's #1 Sign and Flag maker! Here at the Sign Store, we do it all - custom vehicle lettering, small and large commercial signs, flags, and everything in between! High quality products, competitive pricing, and customer service that's second to none. From work trucks and vans, to semi-trucks and limousines - vehicle lettering is one of the more popular services we offer. Our lettering is made from premium outdoor durable substrates and prints. Bring us your ideas or come in and let us show you what we can do! 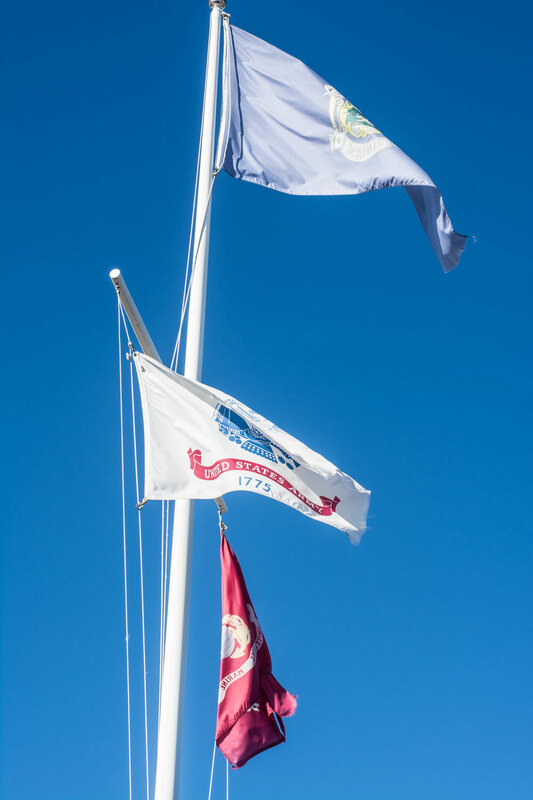 The Sign Store is proud to offer a huge collection of high quality flags, flagpoles and installation services. From indoor/outdoor, small and large, state flags, country flags, decorative flags and everything in between - give The Sign Store a call and let's get your flag flying! Meet Maine's #1 Sign and Flag Maker! 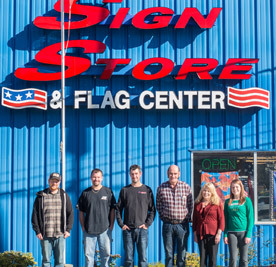 The Sign Store & Flag Center in Auburn is the #1 sign and flag center in Maine. Your sign is the first thing people see when they visit your place of business or see your business vehicle on the road. It should not be a surprise that your sign is your #1 advertising opportunity – from the smallest job site signs all the way up to large lighted sign boxes and faces, the Sign Store in Flag Center in Auburn has all of your sign needs covered. The Sign Store & Flag Center in Auburn is a full service sign shop offering design services, production of your sign needs, and installation/maintenance services for installing and maintaining your sign. Quotes are free and with our competitive rates and fast friendly service we assure your satisfaction. Call us today at 1-(207) 784-4515 at and let us show you how we can work for you and your business. If you are looking to advertise with your vehicle or if you’re just looking to do a few personal touches on your ride we are just the stop you were looking for. All of our lettering is made from premium outdoor durable substrates and prints. Bring us your requests or ideas or come in and let us show you what we can do. We offer installation on all graphics or if you would like to do it yourself check out our installation recommendation page for instructions. We sell and install a full line of commercial and residential, aluminum and fiberglass flagpoles. We also stock and sell a wide variety of flags from standard US flags and state flags to custom made flags. Feel free to call or email in your request for custom orders or pricing for installation/maintenance costs for flagpoles. We are a full line distributor of Atlantic Fiberglass Premium Flagpoles. These poles have a gloss white finish that will not fade like paint or tarnish like aluminum or bronze. We carry lengths from 20′ – 100′ If you are looking for a residential pole we also have you covered with our 15-20′ telescoping and aluminum flagpoles. We also install what we sell in Maine so if you would like an installed quote please call us (207) 784-4515 at or shoot us an email. 1/16″ duro and 1/8″ maxi. The only difference in the materials is the thickness. The 1/16″ is great for mild use where the 1/8″ is great for larger parking lot stencils that will be used and abused often. Please take a look through out online catalog and if you don’t see what you are looking for just send us an email and we will provide you with a custom quote. (207) 784-4515 or email with your needs. We will help you find exactly what you’re looking for. Let us know how we did, and how we can improve: Leave some feedback.